This was a “what can I throw together” kinda dinner, but it turned out to be great and I thought I’d share it for all of you throw together types. 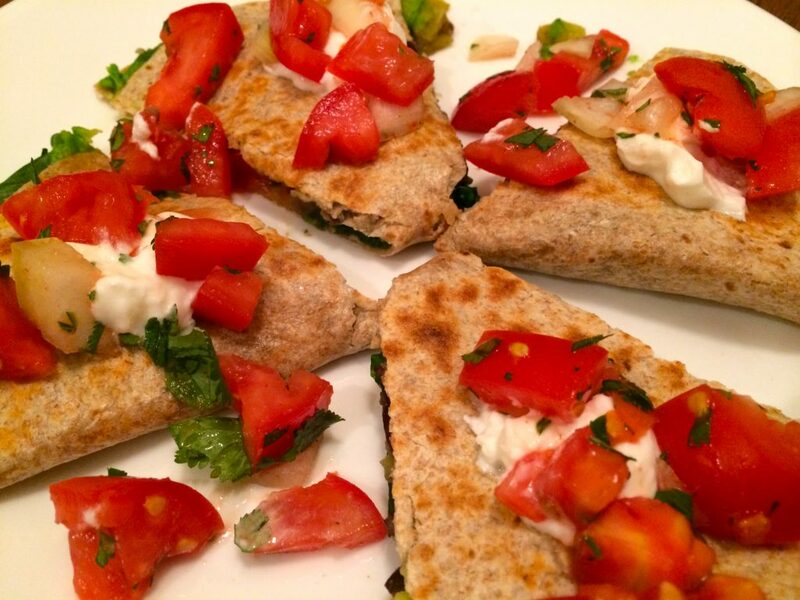 You can make healthy quesadillas any time if you keep whole grain tortillas on hand along with some fresh salsa, greek yogurt and your favorite veggies or lean protein. 1. In a large bowl, combine tomatoes, onion, cilantro, lime juice and cumin. Set aside. 2. In another bowl, mash the beans and stir in the green chiles. 3. Place a large skillet on medium heat. Arrange 6 tortillas on a flat surface. On half of the tortillas, evenly spread the avocado slices, bean mixture, spinach, cheese then a spoonful of salsa. Fold the tortillas in half and place in the skillet, cooking about 5 minutes on each side until crisp. Cut each tortilla into 3 wedges. Serve with a dollop of plain Greek yogurt and an extra spoonful of salsa.